I had an hour to kill driving home after getting ahold of Radiant Historia for the Nintendo DS, so I popped in the soundtrack for a listen. Most DS games don't come with a soundtrack CD in a separate jacket, tucked neatly inside a wraparound cardboard box. Radiant Historia does, and what's more, the tracks are all "piano selections." Instead of sequenced electronica from the game, they're unembellished interpretations, much like the songs on the Final Fantasy piano albums. Those interpretations come to us courtesy Yoko Shimomura, a composer who's been writing game music since the late 1980s. If you don't know her name, you probably know her work: Super Mario RPG, Parasite Eve, Legend of Mana, Kingdom Hearts, Little King's Story. And that's less than one-tenth of her discography. Her work in Radiant Historia may be some of her finest, judging from the disc's five tracks, three or four minutes each, or about 20 minutes total. I'm assuming she's performing here, too. There's a kind of elegant, deliberate simplicity to each of the songs, which avoid tonal conventionality without ornamentation. My favorite's probably "A Place Where Wind And Feathers Return," a melancholy almost-lament that's played hand-against-hand with simple quarter notes. After I got home (what, I'm supposed to play and drive?) I brought up the game and tapped through the intro, which drops you right into Radiant Historia's attractive 3D engine. In a vaguely medieval fantasy world, you've got an empire that's imploded for ecological reasons, something the game refers to as "desertification" (yep, it's a word, and it means just what you think it does). The remaining nations want control of the arable leftovers. 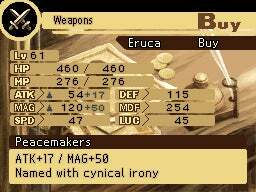 Cue conflict source and Radiant Historia's dramatic impetus. Enter you, playing an intelligence agent for one of the powers that be, toting a special book that lets you travel through time, the idea being that a "true" history exists somewhere in the timestream, and it's up to you to discover it. Think Chrono Trigger, obviously, or even Zelda: Ocarina of Time, only here more invested (ostensibly, anyway) in the nonlinear, multidimensional concept. You want the game to play differently? Hop to a decision point and choose another path. No token BioWare-style head pats, where whatever you choose, the game plays out more or less as it would have anyway. The starting area--a steaming pipe-riddled city dubbed Alistel--serves to walk you through the essentials. Light blue save points percolate at points along your path. Treasure chests occupy hallway corners and strangely unlocked hotel rooms. Walking up to citizenry and tapping the action button elicits snips of background about the city or general state of affairs. You can move with the d-pad or by tapping the stylus on the touchscreen. Your party advances by levels, and individual members have health, magic, and experience points. It's all pretty conventional, in other words, at the outset. After poking around Alistel's explorable areas, exhausting conversations, and plucking items from unguarded chests, I popped out of the city and turned south. The world map lets you amble to and from linked locations like Tactics Ogre (see 'So Far, So Clinging Together') or Jeanne D'Arc (see 'Henry the Possessed, I Am, I Am'). Unlike those two, clicking a location brings it up and lets you explore several screen-linked areas. When you bump into bad guys (no random encounters here) you shift to a sideways screen. Enemies appear on a 3 by 3 battle matrix at screen-left while your party stacks diagonally at screen-right, and battles proceed by turns displayed on the DS's upper screen. 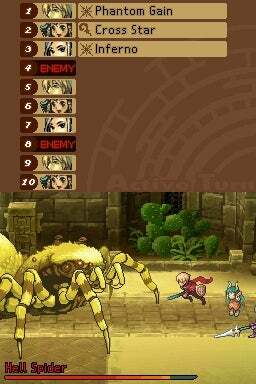 You take damage based on where the enemy attacks from (front row more, back row less), which by itself would rate cliché, but Radiant Historia's clever twist lets you tap skills that shift the enemy's position on the grid. Stocke's "push assault" knocks an enemy back two full spots, for instance, and other skills gained later let you knock enemies left or right as well, lending battles a tactical-spatial dimension. I'm not far enough along to weigh in definitively, but it's looking promising. You can "cluster" enemies by manipulating their position, for instance, then spring combo attacks to hit them simultaneously. You can also "change" out turns with allies or enemies, the idea being that letting an enemy go first and taking it on the chin might be worth the added combo bonus you gain by waiting to act with an ally simultaneously. Even stealing from enemies comes with wrinkles, say increasing your chances of success if you "overkill" an enemy before pickpocketing. If I had to complain about anything, I'd probably single out the sound effects. Well, just one: The sound you make when walking or running, a kind of "chucka-chucka" noise that sounds irritatingly like a low-fi sample of a machine gun, played at half-speed. Okay, back to the game now, and next up: Time-travel without regrets.